Modern Times x Garage Project Blam! Blam! Brewer Description: I could not find much information about this beer online or anywhere else. 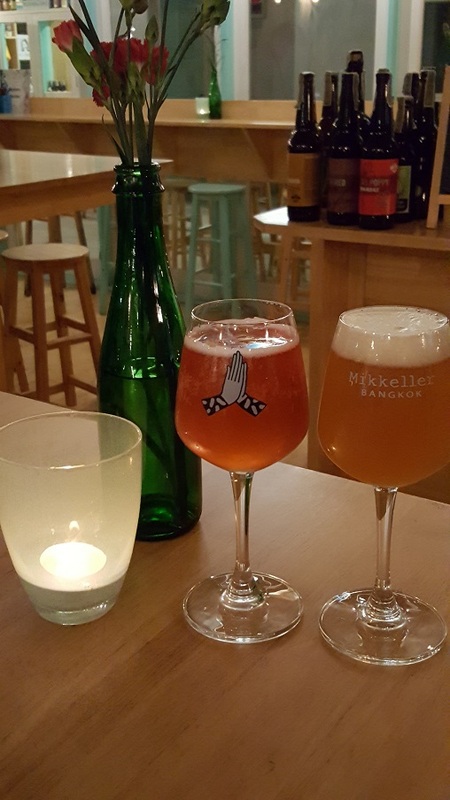 Intro: A 200ml pour on draft at Mikkeller Bangkok into a mini stemmed Mikkeller tasting glass. Appearance: It was a hazy golden orange colour with a one finger off white head that had good retention and nice lacing. Aroma: A complete fruit bomb of grapefruit, mango, peach and apricot. Taste: Very nice bitterness, grapefruit rind and peel, orange, mandarin, honey and caramel. Overall: Like a Northeast IPA with the absolutely wonderful haze. Very nice fruity aroma and good bitterness. A great collaboration with Garage Project. Blam! Blam! is the glass on the right in the photo below. Just for additional info, the glass on the left is the 18th Street Cherry Gose.